Designer Hedi Slimane's debut menswear effort for Celine was the most highly anticipated show of the season. See photos. PARIS (AP) — Passers-by gathered outside the giant glass windows of Celine’s traffic-stopping show venue Sunday night: erected in Paris’ sparkling Place de la Concorde, which is also used as a traffic circle. Designer Hedi Slimane’s debut menswear effort for Celine — the most highly anticipated show of the season — also drew the stars inside, including Courtney Love. All were all eager to see the new face of the age-old Parisian stalwart that’s historically always been associated with dressing women. Here are some highlights of Sunday’s installment of Paris Fashion Week. Has Hedi Slimane lost some of his attitude? The former Saint Laurent designer who courts controversy and provokes outrage from fashion editors at almost every turn seems to have turned a new leaf. Sunday’s menswear debut for Celine showed a different side to the enfant terrible of Paris fashion, one that was restrained and even conservative (relatively). Clean silhouettes that riffed on the ’60s included a checked coat in luxuriant-looking wool or a slim tweed coat. Color was used sparingly. 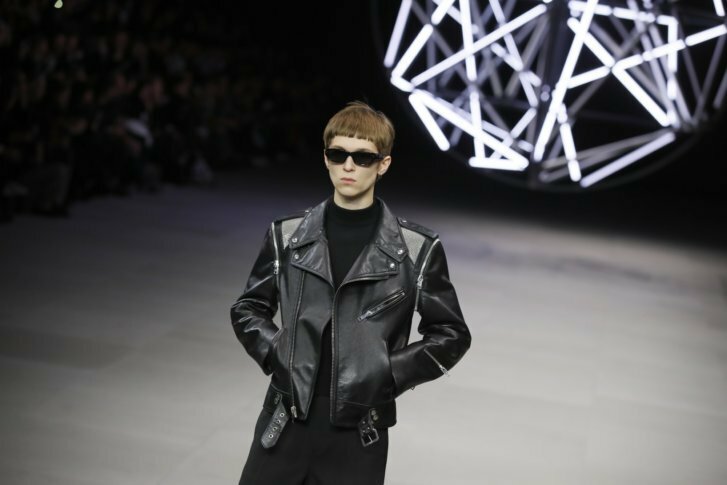 Slimane’s unkempt, waiflike and shaggy-haired models were still there stomping down the runway, as were the retro Teddy Boy touches like winkle picker shoes, white socks and a few statement sparkling jackets. But this new Celine man had a distinctly bourgeois feel. Even signature Slimane garments that would have once been provocative, like a yellow faux-zebra coat, looked restrained owing to their simple and balanced proportion. Was it a little bit low-energy? Decked out in a black velvet top, an excited Love sat front row at Celine as she looked upon the Arc de Triomphe and Eiffel Tower. “I think it’s going to be fantastic. What Hedi (Slimane) does is amazing and it’s an honor to be here,” she said. Love has been writing her memoirs for some years that recounts key moments in her life including with late-Nirvana singer Kurt Cobain. But she told The Associated Press that she’s struggled with the writing process. “My book is three-quarters of the way done. It’s horrible. It’s hard to concentrate. That’s why it’s taking so long,” she said. She said her 26-year-old daughter, Frances Bean Cobain, Cobain’s daughter is one of the main reasons she’s writing to help her child make sense of a life marked by a father’s untimely death in 1994. “My daughter really is my muse. I’m doing it so that she understands things in her life,” she added. Psychedelic Peruvian paintings covered panel upon panel of Kenzo’s fall menswear show that celebrated of one of the designer’s Chinese-Peruvian heritage. The set, painted by artist Pablo Amaringo, evoked scenes inspired by the hallucinogenic Amazonian “ayahuasca” drug — with multicolor space ships, jungle, parrots and deer merging into one — and had some fashion guests squinting amid fluorescent lighting. Designer Humberto Leon’s family is Tusan, a Peruvian people whose ancestors arrived in Latin America in the 19th century from Guangdong province in China. The theme provided a rich fashion tapestry in the clothes — from Andean mountaineering styles with woolies, fun hiking boots, utilitarian rucksacks and amassed layering, to ethnic textiles in flashes of bright color. Beyond the encyclopedic theme, there were some trendy touches in deconstruction — such as a series of cross jackets with Asian-style cinched waists that sported the inner sleeve lining on the outside. A number of houses have in recent seasons been bending the set rules and showing women’s pre-collections or women’s ready-to-wear during the back-to-back menswear and couture calendar such as Proenza Schouler and Rodarte. It maximizes visibility to designs in front of world’s fashion press. Other houses have started to combine women’s and men’s collections, like Saint Laurent, in a cost-effective move that reduces the amount of glitzy presentations they are obliged to put on each year. Kenzo used the menswear media spotlight Sunday to showcase the women’s fall-winter ready-to-wear as part of the same runway show. The styles borrowed from some of the menswear themes as they riffed on Andean references, and included some wacky style twists such as colored feather boas, stoles and hats that gave the female designs a slightly 1920s Parisian feel. Gender fluidity is a hot theme in the increasingly androgynous landscape in Paris fashion. Labels such as Maison Margiela have gone co-ed in recent collections, as designers blur the boundaries between men’s and women’s clothes in a bid to produce genderless designs. Much-feted womenswear designer Jacquemus returned to male designs Sunday, one year after the young French designer expanded his lines into menswear with a show in southern France. Simon Porte Jacquemus, 29, found fashion fame for his relaxed, summery women’s styles that harkened to his native city of Marseille on the Mediterranean coast. Here in Paris, and in menswear, the fall-winter collection captured this nonchalant, sunny vibe in light open white cotton sweaters with an outdoors motif, a loose double (backslash)-breasted yellow suit worn against bare skin and an unseasonably bright color palette. An olive tree that made up the set decor glistened in the background and contrasted with the misty Parisian weather outside. Broad square pockets and boxy proportions provided one new style idea, but the show was too relaxed for its own good and lacked the creative energy of his women’s designs. Its most potent effect was to spur on fatigued fashionistas to yearn for bluer skies and warmer temperatures.